NEW YORK - Nov. 5, 2018 - PRLog -- American Conference Institute (ACI) is pleased to announce that Stephen Cox, Deputy Associate Attorney General, Department of Justice, will be delivering a dynamic keynote address. We are honored that he will be joining government enforcers from the District of Columbia, the Eastern District of California, the Northern District of California, the District of New Jersey, the Eastern District of New York, and the District of Rhode Island. 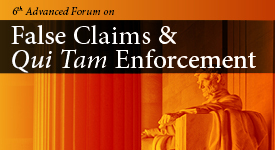 ACI's 6th Advanced Forum on False Claims and Qui Tam Enforcement Conference is the only forum that the "who's who" of FCA litigators have designated as the event which sets the standards for this industry's practice. Newly designed "Perspective Sessions" will contemplate the impact of: Escobar, the Granston and Brand Memoranda and the expanding reach of the False Claims Act. Join our distinguished faculty as they examine such burning dilemmas as, what to expect in Fiscal '19, which industries are at greatest risk, where government enforcement priorities lie, and how you can prepare for the next wave of FCA enforcement to best protect your interests. Reacting to this year's faculty and program contents, conference co-chair, Catherine Kane Ronis, Vice President & Associate General Counsel, Litigation and Investigations at BAE Systems, Inc., noted that "I look forward to this conference every year! It provides valuable insight into how the various stakeholders analyze FCA issues – industry prosecutors, and relator counsel!" Conference co-chair, Roderick Thomas, Partner at Wiley Rein LLP, similarly remarked that, "ACI's False Claims Act conference is as dynamic as its New York City location – always an extraordinary mix of viewpoints of government lawyers, in-house counsel, defense bar and whistleblowers' counsel."